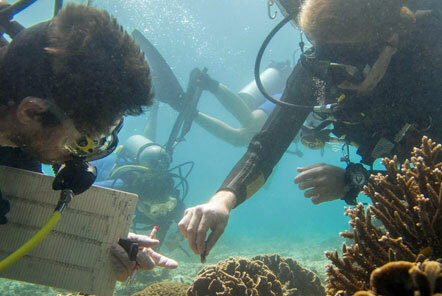 Our Marine Conservation project in Thailand conducts ongoing research into a variety of issues affecting the health of Thailand's coastline throughout the year. In this blog, we look at their research into one particular coral predator - Drupella snails – which the team have been actively studying since 2010. Drupella snails are a small mucirid gastropod found throughout the indo-pacific ocean which feeds on living coral tissue (coralivore). There is a lack of information or descriptions of these snail species prior to 1982, but subsequently they have been found in large aggregations or outbreak populations in areas such as Kenya, Australia, Hong Kong, the Red Sea, and the Gulf of Thailand. Drupella snails feed on coral tissue, for a long time it was thought that Drupella snails fed only on the Acropora, Pocilliopora, and montipora families of coral, but in their studies our Marine Conservation project has found the drupellas feeding on over 20 genera of corals. Why are there so many? These outbreaks, or overpopulations, have led to dramatic loss in living coral tissue, reduced reef resilience and recovery, population regime shifts, and possibly increased disease occurrence. The outbreaks occur due to more of the larvae and juveniles surviving, just like the case of Crown of Thorns Starfish. One female can produce over 100,000 eggs, which will turn into free-swimming larvae. Most of these larvae should not survive, they should be eaten by fish and plankton feeders (including the corals themselves!) or starve to death in the clean waters of the ocean. When the fish are removed due to over fishing, or the water quality decreases due to nutrient inputs, then more larvae survive to adulthood. Once the become adults they have very few natural predators, as they are a very unattractive food source. 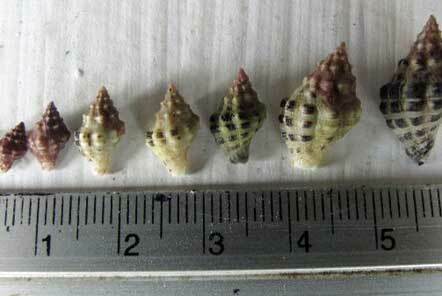 Following the bleaching event of 2010 the team in Thailand experienced a large overpopulation of Drupella snails on reefs around the Southern part of the island. 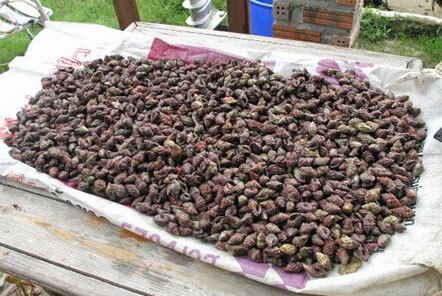 The marine conservation project team and volunteers immediately began daily/weekly Drupella snail collections, spending over 1,700 diver hours to collect well over 10,000 snails. Additionally, they now do Drupella snail collections on most dives, but rarely collect the data, the project estimate that they have collected over 60,000 Drupella snails over the last 2 years. What is the team doing? Whilst collecting and monitoring the population is one activity, the project also works with researchers from around the world to document the changes in populations and dietary preferences of our local Drupella Snails populations. To date, the literature has primarily focused on identifying unsustainable populations and their short and long term effects on reef health. Little or no information has been published to direct governments and other groups how to relieve or manage this problem. 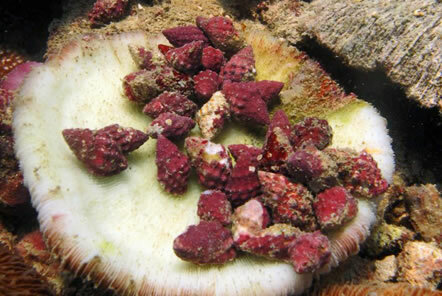 The Marine Conservation project has proposed that guidelines be established and removal techniques developed to guide governments and reef managers faced with loss of economies or ecosystems values in the face of the proliferation of Drupella snails and are working to write a manual to spread the knowledge to other local reef management groups. The project staff, interns and volunteers have published two papers on Drupella snails covering topics such as dietary shifts following bleaching events and the population structure and feeding preferences in Koh Tao. If studying coral predators such as Drupella snails is of interest to you then the Marine Conservation team have been at the forefront of research in Koh Tao and would love to have you join the team.